I very recently had an interesting consulting engagement. The customer was using a SonicWALL firewall to do the routing for all their internal VLANs and wasn’t getting the throughput or performance that they were expecting from their HP 1Gbps network. I explained to the customer that they were routing internal traffic through the SonicWALL and if they didn’t have a need to isolate the VLANs using a firewall they should move the routing to their core HP 5400zl switch, thereby providing wire speed routing and switching within the internal network. In this configuration traffic would only hit the SonicWALL firewall when the packets were destined to the Internet or to a remote VPN location. I made the various configuration changes on the HP 5400zl and oddly enough I couldn’t get routing to work. I had two laptops on opposite VLANs which couldn’t communicate with one and other. I could ping both laptops from the HP 5400zl switch but the switch didn’t appear to be routing the packets even though IP routing had been enabled. I took to Google and quickly found a thread on the HPE Community website titled, Inter Vlan Layer 3 Routing on 5400. I quickly learned that the command “management-vlan 1” disables routing on that specific VLAN. I issued a “no management-vlan 1” and I could immediately ping between the two laptops without issue. After I little more research I found the following explanation. Secure Management VLANs are designed to restrict management access to the switch to only those nodes connected to the Management VLAN. That is, only clients who are connected to ports who are members of the Secure Management VLAN can be allowed to gain management access to the ProCurve device. This sharply limits the universe of devices that can attempt unauthorized access. Any VLAN can be assigned as the management VLAN. Take care to ensure that the same VLAN is configured as Management VLAN on all ProCurve switches that are to be members of the management VLAN. Only one VLAN per switch can be identified as the Secure Management VLAN. IP addresses must be assigned manually to the Secure Management VLAN. The switch will not allow the Management VLAN to acquire its address through DHCP/Bootp. To maintain the secure nature of the management VLAN, only ProCurve switch ports that are connecting authorized management stations, or those extending the management VLAN to other ProCurve switches, should be members of the Management VLAN. Internet Group Management Protocol (IGMP) is not supported on the Management VLAN. Routing to or from the Secure Management VLAN is not permitted. Routing can be enabled on the switch and all other VLANs will be routable, but the Secure Management VLAN will remain isolated. The customer did tell me that they had tried to add IP routing to the HP 5400zl in the past but could never get it to work properly. You can imagine my initial surprise when I too was temporarily stumped after configuring the IP addresses on the VLAN interfaces and enabling IP routing. Thankfully some quick research provided the solution. One of the most popular blog posts I’ve written in the past five years is, VLANs and IP Routing on an Ethernet Routing Switch. It continues to be the top post on my blog so I decided to write a follow-up using Cisco equipment. This has been covered many times on the Internet before but I’m going to try and add my spin to it here. 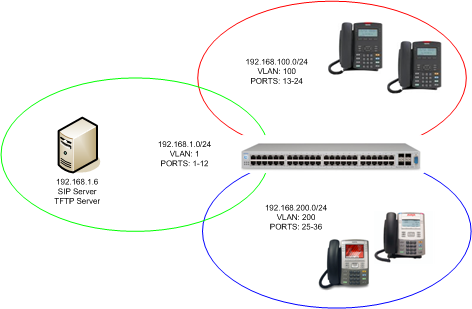 In this example I’m going to take a Cisco 1921 router and a Cisco 3560-CX switch and show two different examples of how you could design a simple topology. This was and still is a widely accepted design although it has significant limitations since the legacy Cisco router is generally not capable of wire speed routing. In the case of the Cisco 1921 it can handle anywhere from 68Mbps – 110Mbps depending on packet size and configured features. Lots of people upgrade their Layer 2 switches to Gigabit only to later figure out that they can’t achieve Gigabit speeds between VLANs because they are routing between VLANs on a legacy software based router. In this design all the internal routing occurs on the Cisco 3560 which is capable or wire speed switching and routing thanks to the ASIC hardware. In this case we can now achieve near Gigabit transfer speeds between the VLANs, the only real variable is the speed of the actual source and destination device – servers, laptops, desktops, etc. We isolate the WAN router so it’s only required when we need to communicate with the WAN or Internet. We might only have a 50Mbps Internet connection so the legacy router is capable of handling that amount of traffic and provides additional features such as NAT for hiding our private network from the public Internet. Let’s look at the commands needed for the second example. In this case you’ll notice that I added a few IP routes to the configuration. In this case I added a default route on the Cisco 3560 forwarding traffic to the Cisco 2921. I also added IP routes to the Cisco 2921 for the IP subnets that we configured on the Cisco 3560. It’s not enough that the network knows where to send traffic to the destination. The network also needs to know how to send the replies back to the source devices, so we need routes in both directions. Note: Thanks to Cisco for providing the equipment I’m using today, it’s a small switch and router but it’s really helpful when working through example topologies to work on real equipment. Theoretically this shouldn’t be an issue but I’ve seen it be an issue time and time again. This configuration usually results in performance issues because ICMP redirects are ignored, or never issued. If we set the default gateway for the Windows 7 desktop/laptop to the Cisco 2921 Router then all traffic that’s not local to this network will be sent to that router. That includes traffic for other corporate networks and for Internet traffic. 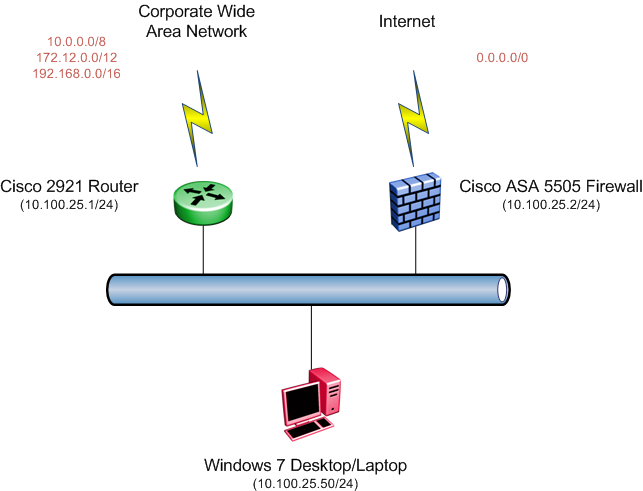 In theory the Cisco 2921 Router will forward traffic destined for corporate networks out over the WAN while it will forward traffic for Internet based destinations to the Cisco ASA 5505 firewall. When it forwards traffic to the Internet it will also issue an ICMP redirect to the Windows 7 Desktop/Laptop informing that device that 10.100.25.2 is a better destination for traffic to the Internet. If we set the default gateway for the desktop/laptop to the Cisco ASA 5505 firewall then all traffic that’s not destined for the Internet will still be sent toward the firewall. In the case of the Cisco ASA 5505, since it’s a firewall it won’t issue ICMP redirects to the desktop/laptop so all traffic will need to pass through the Cisco ASA 5505. 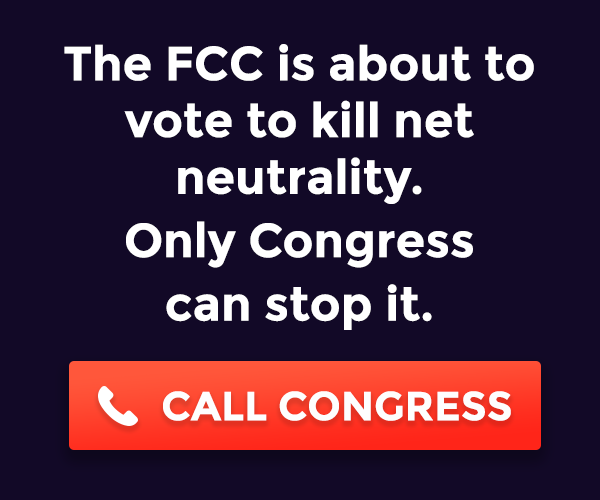 I’ll be honest and say I haven’t seen this too much lately and in smaller networks it doesn’t usually amount to much of a problem. In larger networks though I’ve seen a lot of performance issues around this scenario.So the easy solution is just don’t place the firewall on the same network segment as any of the desktops/laptops.